What Child Discipline Is Not About! Child discipline is teaching the child the correct way. Most parents mistakenly consider the following actions as the correct way of teaching discipline to the child. rather it will just make the situations more complicated. 1. Punishment- Setting boundaries and expectations for good behavior, you are laying down the foundation and giving your child tools to work toward self control and self regulation.. child discipline is not about punishing for bad behavior, rather it is about guiding the child toward a positive behavior. but it doesn't that bad behavior should be ignored. if he breaks the rules, there must be a clear and consistent consequences. The most important of imposing consequences can be a time out or loss of privileges or other repercussions. This can be the tools to correct bad behavior calmly rather than punish the child out of anger. 2. Expressing anger- Only few parents can say that they've never lost their temper in the midst of the situation when a child is being defiant. That is why it is very important to keep in mind to have a cool head when correcting child's bad behavior. being calm can help parents to better explain to a child why disciplinary action is being taken, on what exactly they are disappointed about, and what to do in the future to avoid making the same mistakes. And if parents explain the situations in a loving manner, the child will be able to understand that their behavior may have been wrong but their parents still love them. 3. Controlling- Setting restrictions does not mean not letting your child to make choices or giving him room to make mistakes. A child who is disciplined in a positive manner know that their opinions will be heard and that their parents respect them even when he doesn't agree with them. In this way he will gain self-confidence as he explore and grow, as even identifying the choices that will make him wrong or harmful and choices that are positive and healthy. Teaching preschoolers how to write the alphabet can be done in a simple and fun ways. 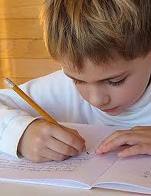 They can learn through constant practice in writing. One way to help them learn how to write is by coloring, tracing and playing games together. Incorporating fun activities will eventually help them know how to write the alphabet on their own. In my experienced, I really have the difficulty teaching my 5 year old son how to write. He seems to be lazy when it comes to writing. He will complain that he doesn’t know how to do it. He even cries because he doesn’t want write. It is a big battle between us every time we set down for some assignments at school. That is why I searched some tips on how to motivate a pre-school child to write. Below are some of the tips which I already applied to my child. 1. Write the big and small letters of the alphabet. Example “A a”. Let him follow what has been written on the paper. 2. Show the letters to the child and sound out the letters with them. Learning the sound of the letters will help them commit it to memory before they begin to write. 3. Associate the alphabet with game, this is to help them memorize. For example, “ A stands for apple”. 4. Let them trace the letters one by one using a tracing paper. After tracing all the letters take away the tracing paper and allow them to try writing the alphabet on their own. You can use colorful pencils or markers and let them color the letters after writing. In this way they will look forward to do more practicing writing if they think of it as a fun activity or just like playing. Encourage them to practice more and let them know that it takes time to learn writing the entire alphabet. And don’t forget to appreciate their output in order for them to be motivated to work. 5. Read together often. This will allow them to see the written alphabet and begin to understand how letters are connected to form words. Reading will help the child to learn how to write the alphabet by seeing the letters often. 6. You can also use ABC flashcards or posters available at any bookstores.